Congrats/best wishes to The Rotund and her Wombat, who eloped yesterday! Please join me in toasting the happy couple and pestering The Rotund with the question of the hour: WHAT DID YOU WEAR? Also, yay for ninja weddings! I want one now. Congratulations! All the best to you both. WTF is a ninja wedding?? Hooray Hooray! *champagne toast* Congrats! “WTF is a ninja wedding? ?” Elopement would be my guess. Stealth being the connection. What is happening in this graphic? 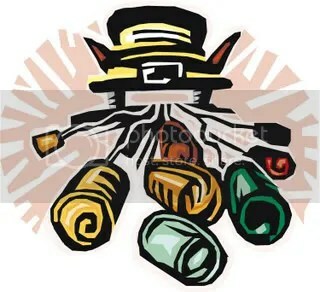 Is a pointy-eared leprechaun’s face exploding into soda cans? I get to ask questions like that instead of addressing the meat of the issue, because I already said congrats to TR. :) Still want to know what she wore, though! I’m still planning to do a post about fat and clothes and weddings, but I might wait a bit now, so I don’t hetero the blog all up. Clipart.com, dude. Of all the “Just Married” graphics there, this one was the least barfy by a mile. But now that I see the leprechaun face, I will never be able to see the car again.